Last Friday, OPAP held a conference call and published management’s expectations for the coming 10 years. For those who follow the company closely this is old news. The rest may find it interesting. 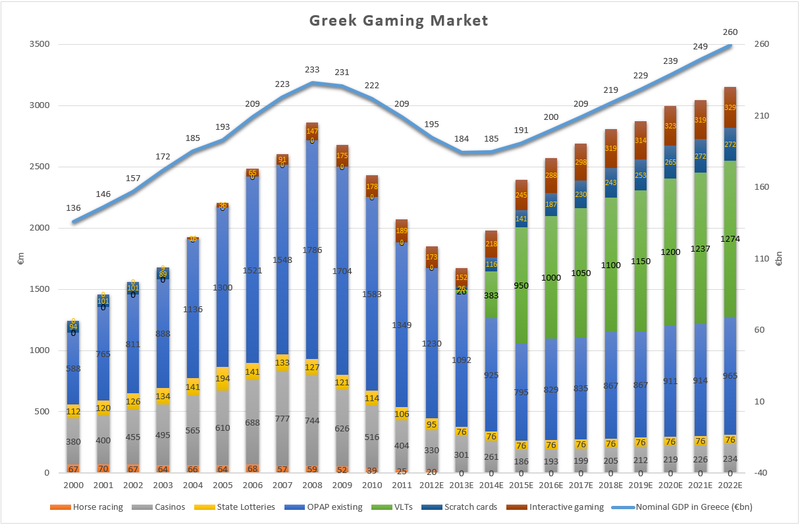 This graph gives you a look 12 years back and 11 years forward into the Greek gaming market and OPAP’s (projected) part in it, as seen by the company’s management. From this year forward, OPAP expects the Greek gaming market to grow at 5.5% (vs 2% GDP and 1% inflation) until 2022 while OPAP’s share grows from 68.4% to 86%. In this way, the company expects to add 19% to the bottom line each year. 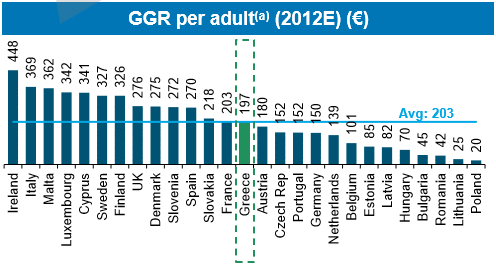 From the presentation, we learn that gross gaming revenue per adult in Greece has dropped to €197 from €310 at the peak in 2008. The crisis has made quite a dent on Greeks’ gambling budgets. 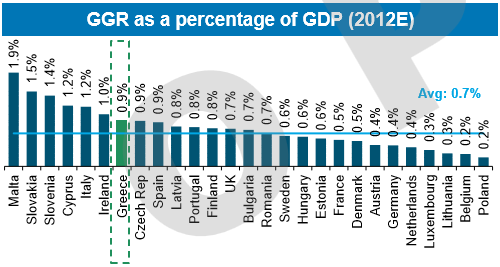 However, as percentage of GDP, Greece remains among the top spenders on games of fortune. This is how OPAP’s segments and profitability looked and are expected to look. VLTs are at the core of OPAP’s growth strategy. As such, they are the most important company-related factor for the future success of OPAP. Management estimates that by 2015 VLTs will constitute a larger part of the company’s games mix than the legacy business. However, the assumption about average daily gross win per VLT from the 2010 presentation that I relied on for my estimates turned out way too optimistic. Instead of €144, the figure has been revised to €76 per day per VLT. The difference is partly offset by the newly revealed information about sub-contracted VLTs. They are forecast to gross the same amount per day while generating about half the EBIT – €50m annually vs €100m for company operated terminals. In percentage terms, OPAP will keep ~22% of gross gaming revenue (GGR) from company operated VLTs and ~8% from sub-contracted ones, which are 12% more in number. Another uncertainty has been addressed in the presentation. Around 30-40% of the legacy business is expected to be cannibalized by VLTs. Spending per capita on games of chance – decreased 36.5% from 2008 peak but expected to recover as the economy picks up, eventually. Location of gaming halls – to be determined. Gaming machines density in gaming halls – in the 2010 presentation the density was expected to be boosted to 50 from the initial plan for 25. However, in the latest presentation, the estimate is back to 25. Variety of games – not disclosed at this time. Recycling effect – less winnings will be recycled because of the 10% tax on all winnings, which however could be cancelled. The rollout of VLTs is behind schedule. Instead of having the company operated machines deployed by the end of 2012 and the sub-contracted – by 2013, both are now projected to be fully deployed by the end of 2014. At the conference call it became apparent that no sub-contractors have been selected yet. 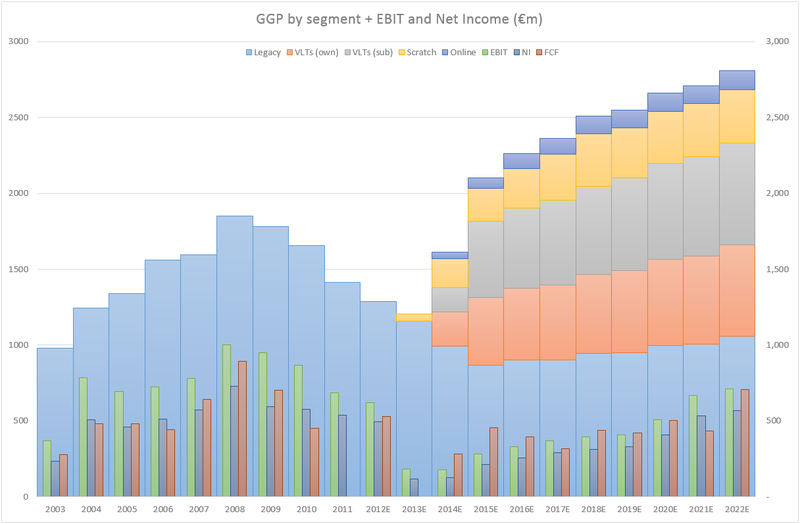 My estimate of net income from the legacy business of ~€100m annually in 2013-2020 and ~€400m in 2021-2030 is close enough to the picture management paints in the presentation. It is the VLT business where I was considerably off due to relying on the Italian market as a proxy. Good that I left some room for error by not counting the income from the sub-contracted VLTs. Starting 2015, OPAP plans to distribute 85% of this stream as a dividend. Historically, the payout ratio has been 95%, so the promise looks credible if the past is any guide. Judging from the current plan, the payout will be lower only in 2012, 2013 (35%), and 2014 (50%). The likely reason is to finance the payments for the extended license and the capital expenditures in relation to the VLT business. Of course, the huge warning here is that these are all forward-looking statements. Talking about what part of these unearned earnings is going to be distributed is rather wishful. And while I am not in favor of emphasizing the future over the past when valuing a company, I think in this case it is the only way to proceed. OPAP’s past is not a good guide to its future. The product mix and the government’s take are changing materially. I still like the prospects, but I will be very careful with this one.